This year’s Macnas Halloween Parade will light up the Galway streets on Sunday 26 October. The organisers promise to blaze a trail of mischief, magic, and mayhem celebrating this Halloween, or Samhain, as it was meant to be celebrated; wild, raucous, and mythical. Macnas is not an organisation known for small measures, and this year the parade is expected to be as big, beautiful, and imaginative as ever. 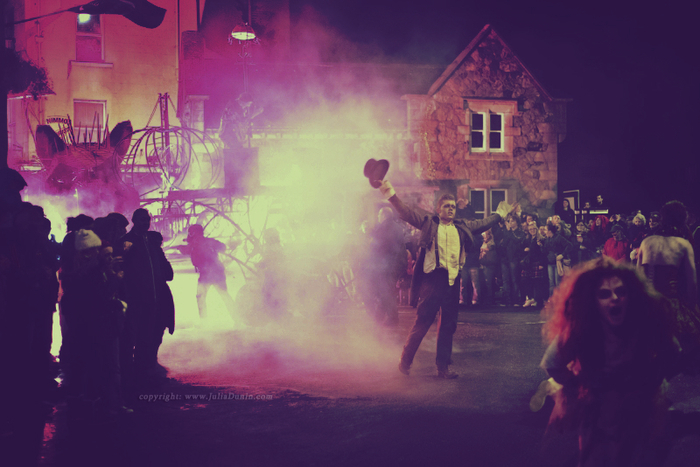 The Macnas Halloween Parade is a free, civic event that brings tens of thousands of people out onto the Galway streets to embrace creativity, mayhem, the surreal, and the spectacular. The 2013 event drew crowds of almost 55,000 people. The initial plans announced by Macnas for the parade include giant marionettes, 300 bespoke costumed performers, original live music, masks, and the usual pyrotechnics. The Macnas Parade is an event made by the people, for the people, and the organisers are asking the public to donate to ensure the future of this traditional annual spectacle and to make sure the usual traffic-stopping action takes to the streets this Halloween. On Friday September 19, institutions everywhere throw open their doors for a free feast of culture throughout the country. Following the last three years of performance workshops and ‘open house’ evenings in Galway, Macnas is now bringing some Culture Night magic to Limerick and Dublin as well as its hometown. Charlie Byrne’s bookshop – winner of Irish Times Best Bookshop in Ireland 2013 and shortlisted again in 2014, will host a Macnas display in its Middle Street window fromWednesday September 17. The display will showcase Macnas’ bespoke, award-winning designs, presenting a rare opportunity to see Macnas masks, props, and costumes up close.